Do you know that our life is affected by a series of rhythmic biological cycles which control various biological processes. These cycles are known as- the physical, the emotional and the intellectual and they are called as Biorhythms. They govern human behavior and helpful in monitoring the lifestyle and carrying out activities in a person’s life. They play a very important role in everyone’s life. It helps to monitor physical, emotional, and intellectual well being of people and create effective teams and schedules. So, today I’m going to introduce you one such app that calculates your biorhythm in a very simple way. It’s called “BiorhythmΩ” which has been developed by Jeonghwan Kim, this year. The app has been compatible with iPhone, iPad and iPod touch having its 8.0 or any later version of the Operating System. 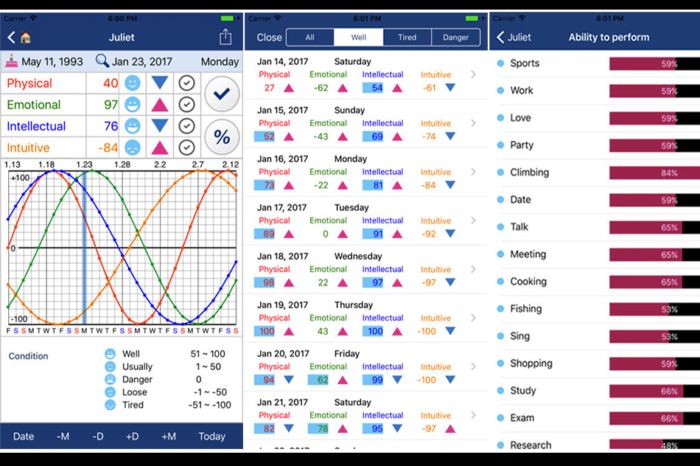 Biorhythm app analyzes Biorhythms of multiple people side by side and display the results in different forms such as- chart, table, report, graphs, etc. With the help of this app you can see how much capable you’re for doing a particular activity. Does your Biorhythm allow you to do that activity or not? If not, then you can get an in-depth look about your Biorhythms and learn about the upcoming critical days in advance so that you can take the right decision. This app is very much organized and it also organizes the profiles of people in different ways and folders and, thereby, creates a detailed summary of their Biorhythms report. BiorhythmΩ tells you about how much percent (%) are you today in terms of judgment, stamina, emotions, etc. The three cycles of Biorhythms are repeated in a uniform pattern which are based on your birthdays. Didn’t get? Let me tell you that when you start using the app, then first of all you’ve to enter your date of birth or number of days of living and it will calculate your 4 rhythms i.e. Physical, emotional, intellectual and intuitive based on some formulas. Each rhythm has a value that ranges from -100 to +100, which indicates the current status and tells you about the various stages. You can change the dates easily and view your Biorhythms for future as well as your past. You can share this information using emails or through messages. Overall, Biorhythm app is a brilliant way to protect yourself by checking your biorhythms daily so that you do whatever you can do and your Biorhythms allows you to do! This app provides you accurate data using formal algorithms. The graphs are very easy to understand and simple and you can use this app anywhere at anytime. The app is available on the iTunes Store for just $1.99. You can download the app and check your biorhythms now and protect yourself! Pros: unique app to check Biorhythms; monitor different cycles of a person; easy to use; display information through graphs; accurate data; sophisticated graphs; share Biorhythms via email or messages; integration management of multiple people; gives preview of future Biorhythms.